There are few forms in which so much authority has been invested with so little reflection as the sentence. Though a fundamental unit of discourse, it has rarely been an explicit object of inquiry, often taking a back seat to concepts such as the word, trope, line, or stanza. To understand what is at stake in thinking—or not thinking—about the sentence, Jan Mieszkowski looks at the difficulties confronting nineteenth- and twentieth-century authors when they try to explain what a sentence is and what it can do. From Romantic debates about the power of the stand-alone sentence, to the realist obsession with precision and revision, to modernist experiments with ungovernable forms, Mieszkowski explores the hidden allegiances behind our ever-changing stylistic ideals. 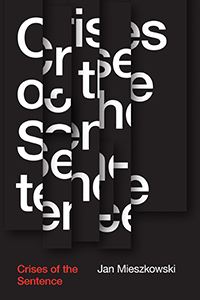 By showing how an investment in superior writing has always been an ethical and a political as well as an aesthetic commitment, Crises of the Sentence offers a new perspective on our love-hate relationship with this fundamental compositional category. Introduction: What Is a Sentence?